China is set to launch its first space laboratory into orbit Thursday (Sept. 29), provided the weather cooperates for the planned liftoff. China's Tiangong 1 space lab is slated to launch aboard a Chinese Long March 2F rocket from the Jiuquan Satellite Launch Center in Northwest China. The prototype, which will test docking technology with the country's Shenzhou spacecraft, is an important step toward China's goal of constructing a crewed space station in orbit. Liftoff is set for between 9:16 p.m. and 9:31 p.m. Local Time at the launch site (Thursday morning in the United States), according to state media reports. China is expected to launch three additional spacecraft at a later time to connect with Tiangong 1 in space. The unmanned Shenzhou 8, Shenzhou 9 and Shenzhou 10 spacecraft are designed to robotically attach to the Tiangong 1 module in what will be the country's first dockings in orbit. "It’s a big deal at several levels," said Dean Cheng, a research fellow on Chinese political and security affairs at the Heritage Foundation, a conservative public policy think tank. "If all goes according to plan this will be China's initial effort at docking, and of course docking is one of those sin qua nons for more prolonged exploration of space. They have to get this skill set down." 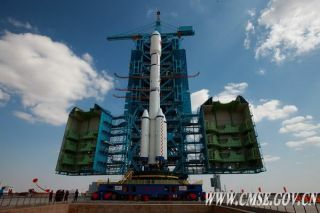 China had originally planned to launch the space lab module earlier, but last month, a Long March 2C rocket, which is similar to Tiangong 1's Long March 2F booster, malfunctioned shortly after liftoff and failed to reach orbit. Chinese officials temporarily halted plans for Tiangong 1 as they investigated the accident, which resulted in the loss of an experimental satellite. In addition to acting as an important test bed for these space station aspirations, Tiangong 1 will also carry medical and engineering experiments into space. The module is expected to remain in orbit for two years, reported state news agency Xinhua. China is only the third nation to independently launch humans into orbit, after the United States and Russia. The nation's first manned mission, Shenzhou 5, was piloted by Yang Liwei on Oct. 15, 2003. Liwei's 21-hour mission was followed by two more manned missions in 2005 and 2008. You can follow SPACE.com staff writer Denise Chow on Twitter @denisechow. SPACE.com senior writer Clara Moskowitz contributed to this report. Follow SPACE.com for the latest in space science and exploration news on Twitter @Spacedotcom and on Facebook.